Our company offers a full set of services for placement and support of a www-site for your organization in the Internet. In order to place your site in the Internet, please call us or e-mail to info@web-hosting.lv. Our manager will contact you, agree on the time suitable for appointment and come to your office for signing an agreement. Your site will appear in the Internet within 24 hours. We provide a certain quota of disc space, mailboxes, various additional services, ensuring continuous twenty-four-hour operation of your web-site. You will get FTP-access to your site, so as to be able to update information at any time. In case of any questions, please do not hesitate to contact our experts. If you need to replace your provider of hosting services due to any reasons, we will consult you on this matter as well. If you still have not registered a domain name for your site, we will help you in selection and registration thereof. Prices for domain names. 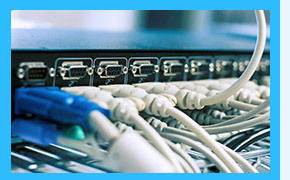 Technical performance of our servers allows solving tasks of practicably any level. We are connected to the overall Latvian system of traffic exchange and have two reserved channels 100 Mb/sec, ensuring high speed and reliability. You will obtain everything you need for professional web-site, namely, PHP, MySQL and FTP. No any extra charges required; all your site traffic is unlimited. Possibility of changing passwords for electronic mail individually. Possibility to activate a re-address and an auto-reply function individually. Possibility to receive electronic messages, using function of ciphered transmission of data. Our offer is not limited to placement of your site only. We can optimise your site for searching servers and enlarge the number of users visiting your site in order to find exactly your services or products.